It’s where you were meant to be: bass fishing. It’s just after daybreak and the traffic on New York’s Long Island Expressway is in full swing. Commuters line up in neat little rows in a well-practiced routine with the aim of getting to work on time. Simultaneously, just east of the Jones Beach Inlet, another traffic jam is taking place, although not as orderly and, perhaps, even borders on chaotic. 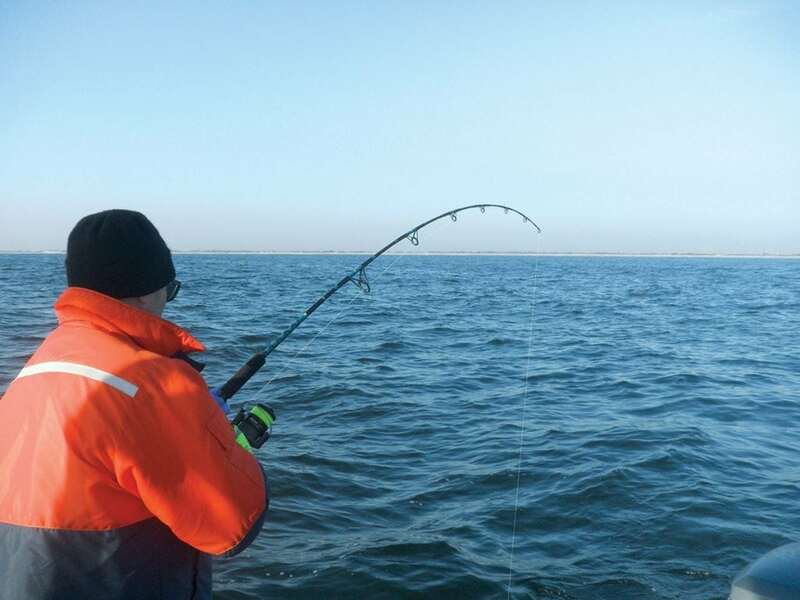 It’s early December, and anglers have flooded the waters of the south shore in an attempt to get in one last bass fishing bonanza as the fall striped bass run is at its height for the season. There is a flotilla of boats, all filled with anglers offering different methods of luring that one prized cow onto the hook. They chum the waters, jig and set live baits, but the most consistent practice is the one that creates the notable log jam. These anglers prefer to troll. A cold December can produce some of the best bass fishing. Trolling involves the dragging of line, preferably wire, with all manner of lures secured to the end. 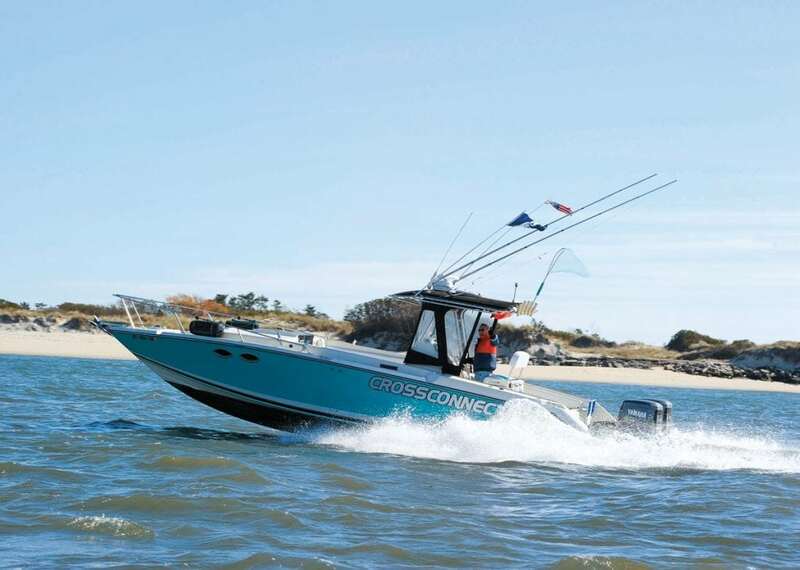 Off of the Jones Beach Inlet, or more importantly, the “South Shore,” area natives have established a very distinct pattern for trolling while bass fishing. They cruise east to west. It is a time-honored tradition, one that is recognized by Long Islanders and respected. However, the lure of the bass has created an influx of anglers who are not native to the South Shore, and this is where the fun begins. Instead of an east-west pattern, the visitors to the area troll north to south, and not in nice little rows, either. They veer to the left and to the right and soon, the trolling aisles become a tangled mess with gear being cut off, or worse, wrapped up in propellers, leaving the radio chatter on channel 68 a lot more colorful than just the request for a sound check. It’s not always this way, and there are times when the only traffic jam that takes place involves the migration of striped bass headed south to Virginia and the Chesapeake Bay in pursuit of warmer waters and a place to spend the winter before next year’s spawning run north. 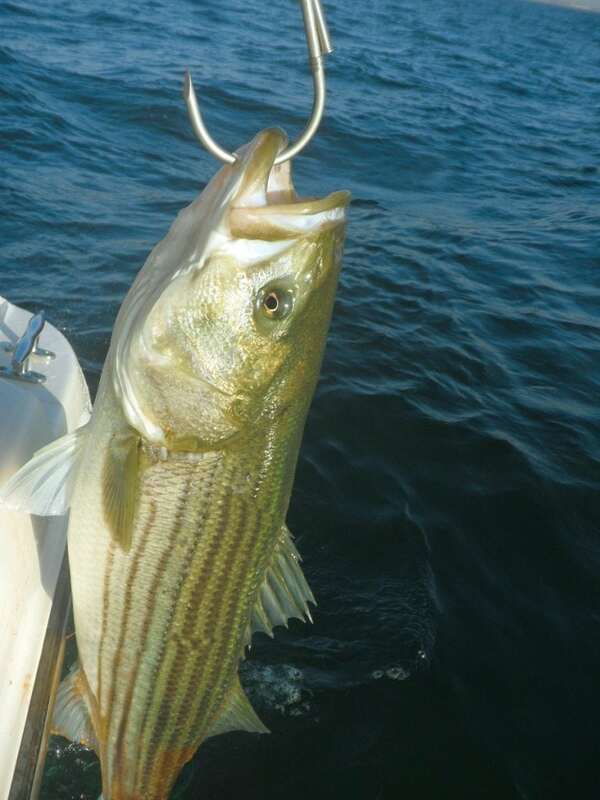 The striped bass are currently welled up just east of the “needle” off Jones Beach. This is where veteran charter boat captain David Mahler comes into the picture. Mahler was the youngest licensed captain on Long Island. He earned his credentials when he was a mere 16 years old and has plied the waters for 41 years. He’s agreed to provide a firsthand look at just what was causing such mayhem. The morning we embark, it’s a frosty 27 degrees outside, the deck of his 33-foot Donzi center console is a sheet of ice, and there’s some doubt as to whether this is such a great idea after all. But the cold has no effect on the twin Yamaha 225s, which fire up right on cue. As we pull away from the dock, the full moon shines down from the west as the sun rises in the east. According to fishing superstitions, it’s an ominous moment, to say the least and, hopefully, not indicative of what’s to come. Quite to the contrary, it turns out to be an angler’s paradise on all fronts. As we break the inlet and turn east, there’s a sea of boats already in place, and the flurry of activity is simply dizzying. They’re all out there: boats trolling, boats jigging and anglers anchored up fishing with live bait. The skies are filled with terns and seagulls above the boats. The birds dive into bait balls and chirp out songs of the success. Anglers celebrate below the musical frenzy. The other magical thing about this morning, clearly quite unusual for the time of year and location, is that the sea is dead, flat calm—perfect fishing conditions. Looking out over the fleet, there appears to be no sign of the vaunted traffic jam. In fact, everyone trolling is doing so with plenty of space and heading east and west in respected rows. The radio is silent except for some gleeful shouts. That’s the sign of catching a big one. Mahler pulls out his homemade five-and-a-half-foot rods equipped with Shimano spin casters. The rods are spooled with a 15-pound green monofilament. We tie off a two-ounce diamond jig tipped with a treble hook and head off in pursuit of a monster bass. Turning east away from the fleet, the fish finder lights up like a Christmas tree. The monitor glows with solid blocks of red and yellow signifying massive amounts of fish. The first few tosses yield some of the smaller versions of the bass species known as “schoolies.” They prove to be a feisty fight but not quite the slobs that make for the best catches of the day. After a few more rounds of playing catch and release with the babies, it’s time to hook into the big boys. Another repositioning puts in a solid block of mossbunker, the type of baitfish the monster bass just adore. We snag a couple, hook them to our lines, and they’re soon back in the water with the aim of seducing something worthwhile. After a mere three minutes, Mahler’s reel begins to sing and with the line peeling off, the real fight begins. The Bellmore captain proves equal to the task, and a short while later he’s gaffing a 35-inch, 25-pound bass behemoth. With the trophy fish safely tucked away in the fish box, it’s now my turn. Consistent with the perfect day comes the prize. It’s a 31-inch striped bass that’s so fat it appears he may have eaten Manhattan. The day continues to be perfect for bass fishing, but the best part by far is that we are nowhere near any traffic jam.